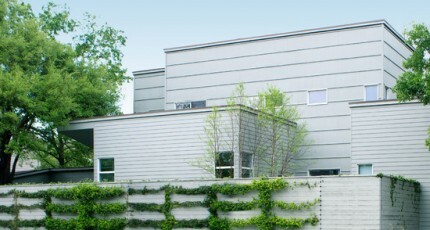 Moss landscaping offers many possibilities to Houston residents. Our humid climate is highly favorable to growing a multitude of moss species. While not all kinds of moss need warmth to flourish, the hot weather we experience here offers an added bonus to the cultivation of moss as the foundational element of a many of landscape features. Adding moss covered rocks to your garden will immediately take it back in time. We subconsciously associate moss covered rocks with age, antiquity, and mystery. Everything from pictures of pristine natural wildernesses to fairy tales and myths are characterized by images of rocks overgrown with luxurious layers of vibrant moss. It does not matter how many trees you have in your yard, or even how large they are, necessarily. Building a shade garden of any size decorated with mossy rocks will immediately make the entire scene look like something far older and more pristine than its actual age could ever suggest. 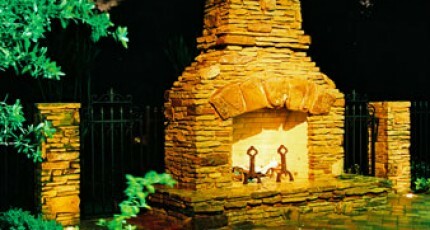 In a smaller yard, a cozy spot like this will give you a place to leave the modern world behind you. Something as simple as walking to the back of your lot and sitting on a stone bench surrounded by moss, flowers, shade resistant plants, and a small fountain will put you in a completely different world in a moment of time. In a larger yard with many trees, we can use moss landscaping to turn your backyard into the equivalent of a mythical forest. Due to the larger amount of space and the size of the trees, you can have your landscaping consulting position moss covered boulders at key locations throughout your yard. When strategically designed with respect to home architecture and tree growth, well-positioned boulders become aesthetic way stations along your journey through your own private paradise. 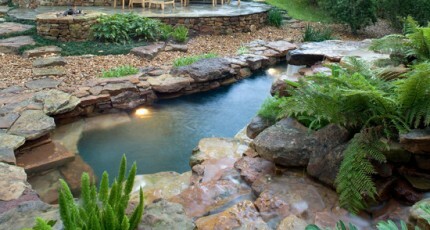 Boulders can add dimension to waterfalls, corners of your yard, open courtyards, and custom gardens. The most important thing to keep in mind about moss landscaping with boulders is that you are not limited to varying shades of green. There are moss species that are as colorful as flowers, so different moods can be established with each boulder in your yard. You can have green for natural life, red for passion, and yellow for joy. Such a variety turns a single outdoor living experience into many experiences of mind and mood, and experiencing all of them is as simple as moving from point to point. If you want to blend the functional with the aesthetic, consider moss covered stepping stones as the perfect pathway into your own private backyard oasis. Typically moss covered stepping stones are used in Japanese gardens to create the feeling that one is not only surrounded by the serenity of nature, but literally grounded in nature itself. Such a stepping stone pathway can be a linear pathway in the form of a walkway. Or, it can actual courtyard foundation where stepping stones form a checkerboard of square shaped gravel beds and moss covered, square stepping stones. This creates a Zen-like experience where gravel and moss work together to calm the emotions with very quiet and subtle suggestions of organic vitality. 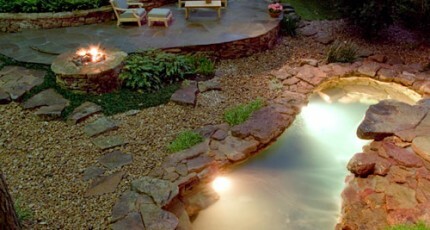 Moss landscaping can also be done without stones or boulders. Many people prefer to have us simply plant moss in a garden and let the colors and forms of the moss define the experience. The obvious value of adding a carpet of moss between your trees speaks for itself. You can walk down a pathway all the way to the back of your yard and be surrounded by compound layers of color and shades of green. This offers you two aesthetic advantages. For one thing, moss landscaping breaks up the monotony of lawn grass. Grass of one species is going to give you only one color beneath your trees. If you plant moss, however, you get a variety of greens and any other color you wish for us to add. Additionally, you get the sense that you are walking across a velvet carpet into your own private paradise. The same thing can happen in other places in your yard where vegetation cannot grow due to a lack of sunlight. Oftentimes a garage will be too close to a house for any light to reach the earth. In this type of place, a moss garden will bring a formerly sterile and lifeless strip of dirt to life. Moss is not only associated with forests, it is also associated with water. Moss landscaping and ponds go hand in hand in this respect. If you are considering having Exterior Worlds build you a pond or natural swimming pool, you should give serious consideration to using moss as a practical way of enhancing its natural appearance. You can plan out the generalities yourself, and then turn the specifics over to our team. Look for the shadiest part of your yard that retains the highest amount of humidity. This is the normally the best place for us to build your pond because it already has the ideal conditions for growing moss. Our design team will then decorate the edges of the pond with moss covered rocks and moss gardens that add vertical impact and authentic colors to the scene. 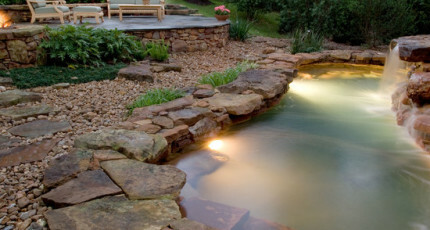 The construction of the pond and the arrangement of the rocks is something you really should have a professional landscaper do for you. Irrigation and drainage are important to both the vitality of your moss and the integrity of your yard as a whole. Without proper management of water, too much water can be as bad as too little for the vegetation growing around your pond. Keep in mind as well that moss can be used to beautify any hardscape or masonry. Moss can grow up the sides of walls and cover columns as easily as it can grow on rocks. It can also be used to create very unique types of gardens such as Bonzai gardens. A Bonzai tree, for example, can be made to look exactly like a large tree when mosses that mimic shrubs and grasses are planted around its trunk. If you can’t figure out how to make a natural pond work for your back yard, consider how it can work if it is highlighted with moss landscaping. Houston has an ideal climate for planting mosses of all kinds of species. These mosses can grow on boulders, waterfall ledges, logs, and tree roots and make you a true wilderness scene no matter how large or small your yard is.